I've written many times about my bag habit, so when I was offered these lush tablet cases from Beatrix NewYork, I obviously said yes! I'm from the school of thought, that one can never have too many bags. There's always that next new outfit or previously unchartered ground that calls for one thing and one thing only. They of course come into a category of their own and if you are anything at all like me - then they are actually the main category of bags in your life as I never leave home without at least two bits of tech and my essentials to stay connected. The kids do a lot of travelling from A to B and an awful lot of hanging around at dance classes and swimming galas, so having their iPads in protective bags is essential to my sanity. 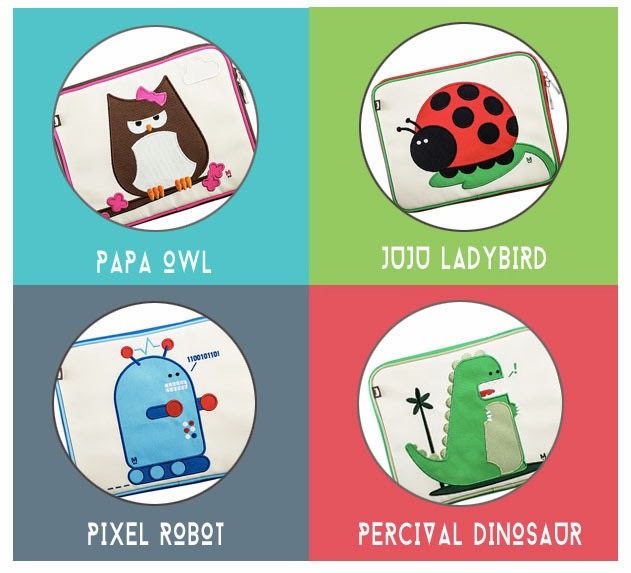 Enter the Beatrix NewYork tablet cases in four rather cute designs and two tween girls to put them through their paces. Cute designs that appeal to all ages. Very nicely padded with a lush soft lining that keeps screens clean and scratch free and a top loading zip for easy access. They are also water resistant, PVC, Phthalate, lead and BPA free, should you want to chomp on them, though I see no reason to want to. And the 10.1" size makes them perfect for a range of tablets and not just iPads. A perfect xmas gift I think! Available in the UK from John Lewis, or visit www.beatrixny.com for more info. DISCLOSURE: I was sent a Beatrix New York tablet case in order to write this review. However the views and opinions are all my own.